I love video games. Always have, and unless something drastic happens, always will. I first picked up a controller at 3 years old (my parents Atari 2600) and have been playing ever since. I would be lying if I didn't say it was my fascination with video games that lead me to study Software Engineer in university so I could eventually take part in my video game industry myself. Which is why I decided to stop wishing I could make video, and decided to grabs some books and start developing. With tons of free and inexpensive development tools now available and direct to user publishing platforms, now is probably a better time than ever to venture into the world of independent game development. The purpose of this blog is to document my progress and problems as I experiment with game development. Ultimately, I would like to someday produce something that wouldn't be embarrassed to publish and ask money for. For now I am going to try and make something that at least resembles a video game. Which brings me to my first project tentatively titled "Stuck in Space". The best way to describe it is pretty much an 'Asteroid' clone, except that the player space ship's engine is disabled. What this mean is that in order to move around and dodge the variety of nasty objects that threatening the ship the player will have to rely on the recoil from the ships weapons. The player will have to think carefully about what they fire at as a bad shot can spend them into spend them into something that they should be avoiding. My reasons for starting with an 'Asteroid' clone mainly has to do with the fact that an 'Asteroid' like game is both simple but offers a lot of room to be creative. I am writing this game using Microsoft Visual C# Express and XNA Game Studio. The biggest deciding factor for using XNA Game Studio is that amount and quality of the leaning material available. 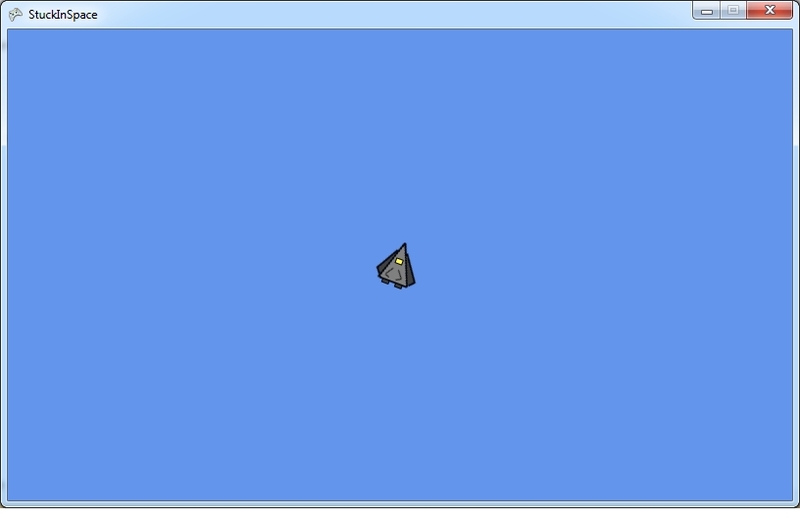 As you can see after about an hour or two of playing around I have my space ship sprite on a blue background. I have also gotten the space space to point in the direction that the user moves a game-pads analog stick. Unfortunately that's about all of the constructive progress I have made, my early attempts to make the ship actually move has had some interesting results. At first the ship wouldn't start moving, next it wouldn't stop. Make the ship move is actually a fairly simple task, and with a simple movement pattern I would probably already be past this stage. Unfortunately, because of the game mechanic of using the ships gun recoil to push the ship (as well as my own desire to have the accelerate and decelerate smoothly) I am forced to make a somewhat more complex system of movement other than push a button to go forward. I guess the best solution for now is to try to get the ship to move properly using a very simple system of physics and then expand upon that. Well, I work on it and report on how it goes. Geometry my old enemy, we meet again!